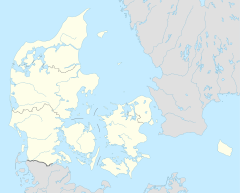 Skalborg station is a railway station serving the district of Skalborg in the city of Aalborg, Denmark. The station is located on the Randers-Aalborg Line from Randers to Aalborg and is part of the Aalborg Commuter Rail service. The train services are operated by DSB. The original station opened in 1899-1900, and was closed in 1972. The station reopened in 2003 as a part of the new Aalborg Commuter Rail service. The train services are operated by DSB. The station offers direct InterCity services to Copenhagen and Frederikshavn, regional train services to Aarhus and Frederikshavn as well as commuter train services to Skørping and Lindholm station in Nørresundby. Wikimedia Commons has media related to Skalborg Station. This page was last edited on 24 October 2018, at 12:43 (UTC).